"Look, Mom, cup holders...in the back seat! And my buttons make all the windows go up and down! And this car smells just like Uncle Ed's!" Not for long, kid. Not for long. Ackk! I must confess that this photo makes me want to run for the hills - or push a portable vacuum into the hands on the nearest child! You've just made my morning a little bit brighter as I giggle my way through it! "not for long, kid!" funny,funny, funny. I had the coolest sports car rental while alone in Tennessee last spring. Felt just like Andrew: "OOOH, look at THIS!" Too funny....who's got clean-up duty? And, how'd the job interview go? Hee Hee!! It still looks better than my car. I had a nice rental car in 2001 and for just a moment, thought about not turning it in. It was SO nice! That's a tiny little mess. Although I try to keep up with the van, sometimes I think the apple cores compost before we get to them. Oh well, these days will pass in the blink of an eye. Thanks for the giggle this morning. Well...... it wasnt so bad, nothing that a Portable vacuum cant clean, right? Funny! My kids are obsessed with the cup holders too! 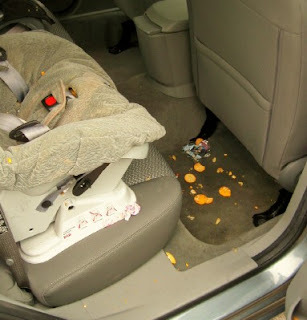 It is comforting to see and know that their are plenty of other moms out there with car interiors that look like mine. I recently found your blog and am really enjoying it. You are inspiring! Lol. Isnt that the way it goes!! Oh if my car weren't 20 times worse, this wouldn't be so amusing! Thanks for the laugh, and hopefully you don't get too spoiled in the rental. Are the children feeling better? Is your husband still excited about the job after the interview? Did your stamina hold out long enough yesterday to get the rental cleaned up? What's the latest word on the car situation? Gee, do we live vicariously through you or what!!! I pretty much crashed yesterday afternoon. I was up at 1 am with the sick kids, making car rental reservations online, etc. Then we ALL had to go with my husband to his interview (!!!) me with the kids in the car...in order to get the rental car. After that we did the pediatrician, where they tested for strep and flu, 'cause it's been recurring here this spring. Nope, just ear infection! The interview went as well as could be hoped, but there are several worthy candidates. Still waiting to hear. I almost don't want him to get this job because we will almost have to pick up and move across the county.